1. The evolution of matrotrophy may be related to high resource availability during gestation and consequently increased opportunity for reproductive investment via the placenta. Thus, matrotrophic species have smaller yolk volume than lecithotrophic species. Innate immune response of offspring at birth, which is important in protection against disease and parasites, may be inﬂuenced by the degree of reproductive investment of carotenoids, such as b-carotene. 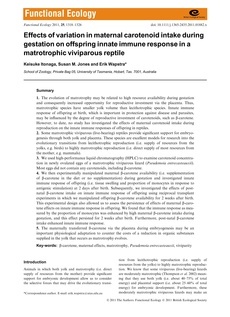 However, to date, no study has investigated the effects of maternal carotenoid intake during reproduction on the innate immune responses of offspring in reptiles. 2. Some matrotrophic viviparous (live-bearing) reptiles provide signiﬁcant support for embryo- genesis through both yolk and placenta. These species are excellent models for research into the evolutionary transitions from lecithotrophic reproduction (i.e. supply of resources from the yolks, e.g. birds) to highly matrotrophic reproduction (i.e. direct supply of most resources from the mother, e.g. mammals). 3. We used high-performance liquid chromatography (HPLC) to examine carotenoid concentra- tion in newly ovulated eggs of a matrotrophic viviparous lizard (Pseudemoia entrecasteauxii). Most eggs did not contain any carotenoids, including b-carotene. 4. We then experimentally manipulated maternal b-carotene availability (i.e. supplementation of b-carotene in the diet or no supplementation) during gestation and investigated innate immune response of offspring (i.e. tissue swelling and proportion of monocytes in response to antigenic stimulation) at 2 days after birth. Subsequently, we investigated the effects of post- natal b-carotene intake on innate immune response of offspring using reciprocal transplant experiments in which we manipulated offspring b-carotene availability for 2 weeks after birth. This experimental design also allowed us to assess the persistence of effects of maternal b-caro- tene effects on innate immune response in offspring. We found that the immune response as mea- sured by the proportion of monocytes was enhanced by high maternal b-carotene intake during gestation, and this effect persisted for 2 weeks after birth. Furthermore, post-natal b-carotene intake enhanced innate immune response. 5. The maternally transferred ß-carotene via the placenta during embryogenesis may be an important physiological adaptation to counter the costs of a reduction in organic substances supplied in the yolk that occurs as matrotrophy evolves.